Celebrate your birthday at the Fort Pitt Museum! Throw your child’s next party at the Fort Pitt Museum for exclusive, after-hours access and an unforgettable experience. Kids’ parties at the fort include full access to museum exhibits, souvenir gift bags from the museum store, and hands-on activities and demonstrations. Get ready to party like it’s 1799! Select up to two interactive children’s activities below for a one-of-a-kind celebration. With the help of a costumed soldier, use candy to make your own cartridge, which soldiers used to load their muskets with gun powder and musket balls. Please note: Black-colored sugar and candy may temporarily stain mouth. Make your own American flag using construction paper, star stamp cutters, and glue. Learn about the function and artistry of a soldier’s powder horn by exploring the From Maps to Mermaids: Carved Powder Horns in Early America exhibit and carving your own powder horn masterpiece. Use nails to punch patterns into tin tart pans to create your own ornament, just like the tin smiths who made tin-punch lanterns in the 18th century. 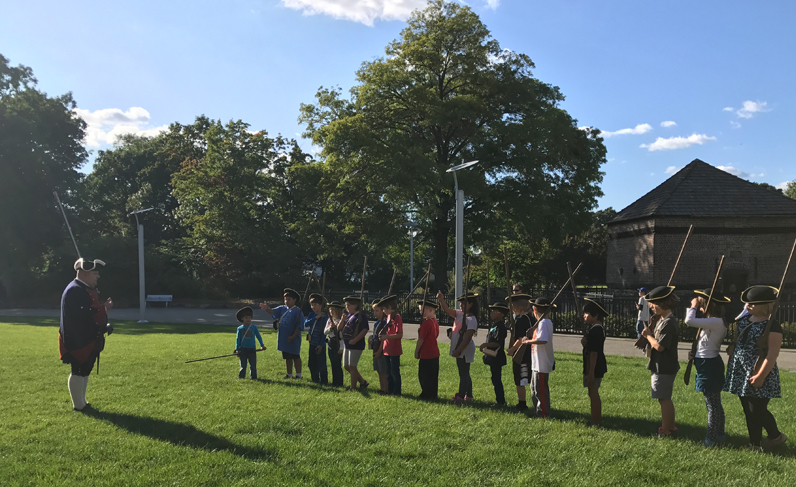 Weave your own Wampum Belt using cardboard looms, plastic beads, yarn, and a plastic needle, and learn about its use in American Indian life and at Fort Pitt in the 18th century. Enjoy a rifle or musket demonstration by a costumed reenactor. Experience a guided highlight tour of both floors of the museum, including the Fort Pitt map, fur trader’s cabin, and second floor galleries. Enjoy a guided tour of either the first or second floor of the museum. First-floor exhibits include the Fort Pitt map, fur trader’s cabin, and reproduction canon. Second-floor exhibits include the main gallery of artifacts and 18th century timeline. Learn about the fur trade and feel real animal furs and reproduction trade items, then play a trading game to make valuable trades with fellow party-goers. Play with historic toys and games including cup-and-ball, graces, and lawn bowls. Become an archaeologist as you search for artifacts scattered throughout the second-floor gallery. Learn about the life of an 18th century soldier by interacting with a costumed reenactor and handling reproduction items found in a soldier’s everyday pack. Then play “Shut the Box,” a game soldiers played on paper to pass the time. Fort Pitt parties are available September through April from 4:30 – 7 p.m. any day of the week. Other dates will be considered on a case-by-case basis. Parties must be reserved at least 30 days in advance and are subject to availability. To ensure adequate supervision, the Fort Pitt Museum requires a 1:5 adult-to-child ratio for children ages 10 and under and a 1:10 adult-to-child ratio for children ages 11 to 17. A $100 deposit is required two weeks after the reservation is made. It is 100% refundable if notice is given two weeks prior to scheduled party date. It is 50% refundable if notice is given one week prior to the date. Balances for parties are due no later than five days prior to the selected date. The Fort Pitt Museum does not provide party decorations. Parties may provide and set up any decorations with prior approval, provided that no decoration is permanently attached to walls, windows, tables, displays, exhibits, etc. The Fort Pitt Museum does not provide food or drink. Parties are responsible for all dishware including, but not limited to, paper plates, napkins, utensils, cake cutting knife, candles, etc. Parties wishing to use a formal caterer must inform the museum for a list of preferred catering options. Please explain briefly what you are looking for in a birthday program with the Fort Pitt Museum. How did you hear about birthday programs at the Fort Pitt Museum?